My fingers are frozen, clutching the tiny cup of coffee and thermos I came prepared with. It’s a rainy, cold day, and I once again lament at not having better gear. Guy gives me waterproof gloves and we continue on our way, ripping around muddy dirt roads. My mind tries hard not to let my nerves take control. It’s been over two years and nearly 25,000km of riding experience, and I still fight the urge to clamp down on the front brake when nervous. Memories from past safety classes come flooding back: lean into your turn harder, keep your eyes up, look through the curve, and open the throttle. Don’t hit the brakes, don’t hit the brakes, don’t hit the brakes! I breathe loudly out of my mouth, a half growl, half cry, expelling anxiety along with air. I feel better, and roll effortlessly through the curve and mud, wondering why I was so nervous. I’m not going that fast anyway. Riding is danger enough; I don’t need to add to it with excessive cornering speed. The bike wants to stay upright. I remind myself of this as I fishtail here and there, giving more gas to straighten out. It works, and is an exhilarating feeling. A hill looms ahead. 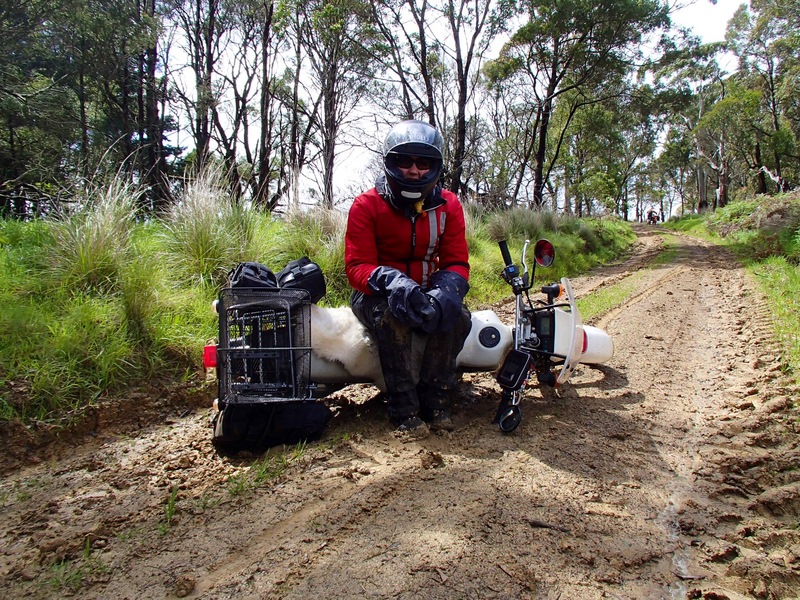 I see Guy’s postie weaving, slipping and sliding, deep in a muddy rut. He doesn’t dump the bike, and regains control. It’s a steep slope for a small bike, and he walks it up the rest of the way, gently rolling the throttle. I don’t start moving until he’s at the top. It’s my turn, and I don’t have high hopes. In first gear, I pick my path poorly, and feel my back tire slide away. A little more gas, and it slides perpendicular to the road. One tire is in the rut, and the other isn’t. Stop. Repeat. Slide. Stop. Repeat. Slide, slide, slide. Stop. Tom-O comes to my aide, stabilizing the back tire as a I struggle up the muck. Another easier section, and then another hill. 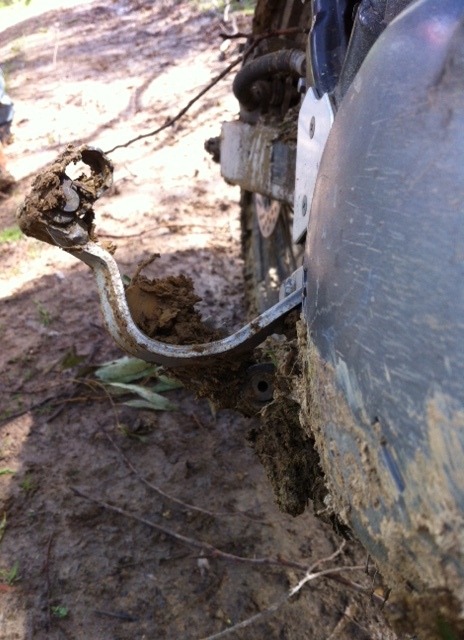 More ruts gouge the sides, but Guy’s already to the top. I start up, staying in the rut to keep my tires in line. I stupidly decide to get out of the rut altogether, and feel the back tire slip out from under me. I put my right foot down to regain control, but my mud-caked foot slips in the mud and Sherpa and I come crashing down. I’m in half-splits, and the header pipe is singeing my rain pants. Tom-O comes running to help, but I shout for him to take a picture instead. I’m not hurt, and it’s these moments I’ll remember. 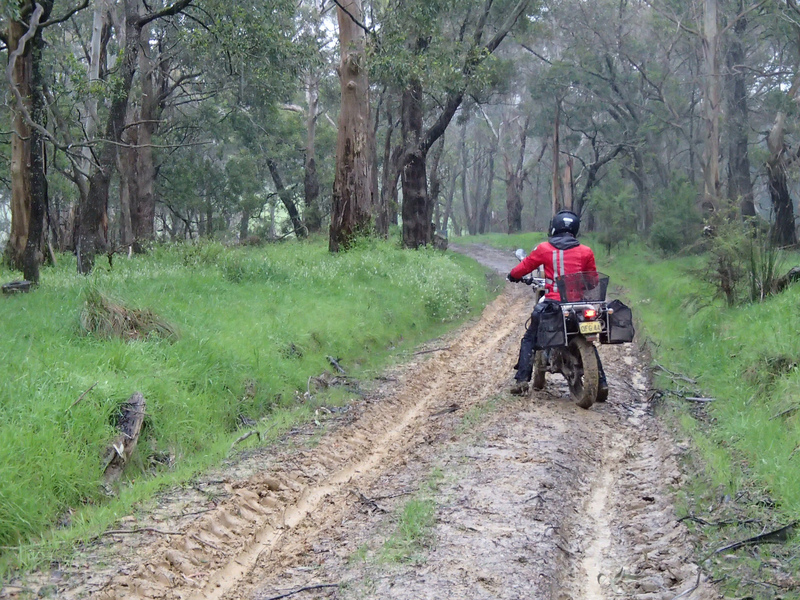 Covered in mud, we right the bike and Tom-O walks it up the rest of the way, with my back brake twisted grotesquely. Guy signals for us to turn around and go back down, but gets some tools out first to set my brake like a dislocated joint in a sling. The mud just gets worse, he says, so I have no choice but to slide my way down, slipping to the left, slipping to the right, until I’m at the bottom. We head for home, with hard sharp hail stinging my face like needles. My visor is too fogged to close, so I squint harder and keep on riding. Once home, I take the best shower of my life, and warmed up, feed the birds again. 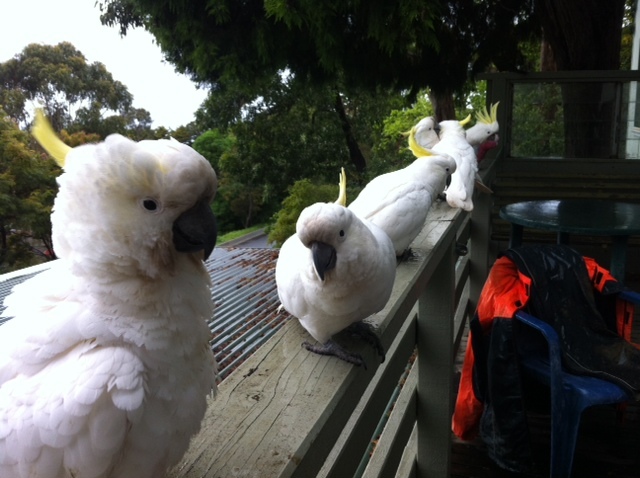 The big cockatoos are scarier close up than I expected, and look like they could take a finger off. I’m careful feeding them, but I don’t mind the little parrots gently nipping at my fingers and toes as I distribute sunflower seeds. They’re getting used to me, and don’t mind landing on my head or shoulder, as long as I keep on feeding them. The galah’s are a bit more shy, but still get close enough to get their fill. Even a Magpie comes to say hello, scratching up my knee with its long, sharp talons. Doubts in life seem to crop up at inconvenient times, but I do know deep down that this is my year of exploration. Ahhhh I miss you so much! It looks like you are having a blast! How are you? My mom and I can’t stop wondering what you are up to! XOXO Oh and guess what I am now dancing en pointe ( pointe shoes) . Love you! I’m glad I read this a little late when you’re already back safe and sound. Except you keep going out and doing it again! :) Beautiful photos and sweet birds! Thanks! It’s been a great trip so far. 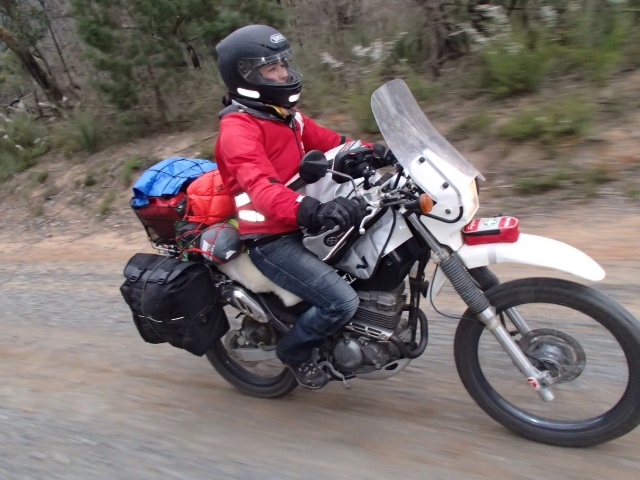 I’m planning a Mongolia to Europe adventure for June 2014 if any motorcyclists (or those willing to learn) want to meet up! Thanks, I wish I could… We have other plans for June… Sounds like another great adventure… Ride safe… Will you be doing any rides here in the U.S. or Texas in the future?